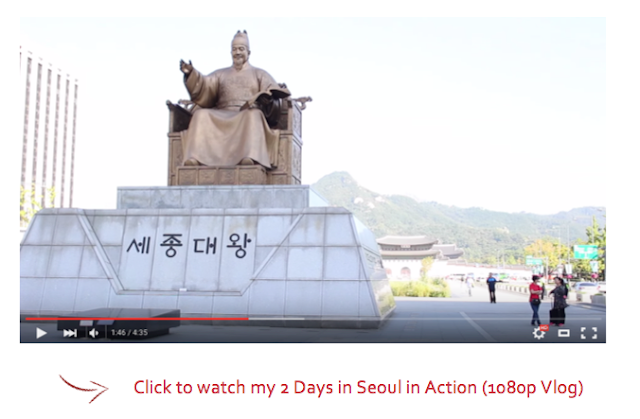 2 Days does seem like a very short amount of time, definitely not enough to really get to soak in a big city like Seoul. But this trip was more intended to revisit some of the places I went to a year ago to film new footage, and it’s also attached to a longer stay in Tokyo which I haven’t been in 5 years. Other than site seeing, there’s also 3 food items on the agenda that for me are non-negotiable, which are: Ginseng Chicken Soup, Korean BBQ, and Dunkin Donuts (not available in Hong Kong!) After living in HK for a while, eating out in Korea seems so much cheaper and you get a much bigger volume for what you pay for. So it was definitely a trip full of food tasting. Korea also has a lot of street food in certain areas where you can just snack along the way. So, I was given a Korean Customs form, and no immigration form. It’s both a blessing and a curse that to Koreans I look Korean. It’s a blessing because I blend right in and I don’t get bombarded by people trying to sell me things. It’s a curse because people ask me questions and I can’t understand what they are saying. Or they replace an English Customs form and don’t give me an immigration form and I end up have to going to the back of the line again after I’ve filled in the form with the squiggliest handwriting ever. This is also the first time traveling alone. To be frank I’m not terrified but was not sure what to expect. When passing customs they stopped to open my luggage as a routine check. I mean, it was filled with one curling iron, 2 outfits, a guide book, make up, and chargers for my camera & phone. It wasn’t checking the luggage that got me nervous; it was the customs officer that asked me about a million questions. It’s as if they cannot fathom the thought of a young girl in her 20’s working overseas alone, and travelling to multiple destinations, alone. But anyway they were more surprised than suspicious, so I was good to go. First thing I see on my right after walking into the arrivals hall is – Gong Cha, a Taiwanese bubble tea chain. Bubble Tea seems to have taken Korea by storm in the recent few years. Perhaps one day it will be a standard drink in all of the 1,000 cafes that Seoul has in the city. From Incheon International Airport to the city center (Seoul Station) is about an hours’ ride, or less if you take the express train which only comes every half an hour. Along the whole ride was just open space, large rivers, mountains in the distance, and trees. It’s a big contrast from Hong Kong. In Seoul, even during busy times on the weekend, most of the subway stations in the city were pretty empty. People probably spend time with their families in suburbs, and then the shopping districts are crowded with tourists. City Hall station was 1 stop away from Seoul Station, which was where my hotel was at. It’s this nice little budget hotel. Two weekend nights cost me only $800 HK, and the room was really spacious with 2 twin size beds (which of course I combined together to make a big King size bed, but then only slept on one side). They also have wifi for each individual room which means stable and quick internet. There was a very big TV as well. I did take advantage of it, and ended up watching this reality TV show starring celebrities’ cute toddlers doing and saying funny things. Only in Asia man, only in Asia. Meyongdong was around a 10 minute walk from City Hall, so I decided to walk and get a feel of the city from there. Surprisingly on a certain section of a main street, most the shops were closed (it was 7pm) and there were a lot of homeless people sleeping in front of the shops. I didn’t realize this last time I was here. I never thought in Korea there would be homeless people. Maybe you’d see a few but I saw at least 15 within a 10 minute walk, which is kind of sad. Just a few blocks away was Myeongdong, shopping district for cosmetics, skin care, and clothing. Er… both? Wait, they speak Korean, Japanese, and Mandarin? Wow, the dedication and determination for the Koreans to do business with the Chinese is just mind blowing. She could explain the menu, talk about the ingredients she’s adding in and chit chat. She even asked if I was cold because the A/C was directly above my head. I know there are some Chinese staff in the cosmetics store, but this lady was actually Korean because I could tell from her slight accent, but her Chinese was pretty amazing. I would not know how to describe Ginseng Chicken Soup in Japanese by any means. The whole chicken soup was 19,000 won, which is only about $16 USD. For a whole freaking chicken! And Ginseng can be expensive sometimes depending on what grade you use. But man if I could, I would have this every weekend in winter when it’s cold. Without fail, free samples and masks drew me in some cosmetic stores in Myeongdong. I ended up picking up this really cool ball tip waterproof eyeliner from Holika Holika. And then a compact bronzer from CLIO that had the pretties packaging ever. Also picked up a Mascara and lip balm from Missha. I went back in the next day to get a BB cream from Missha because they gave me a sample, so it actually works! Enough about shopping. I walked back north of Myeongdong and then along Cheonggyecheon river. 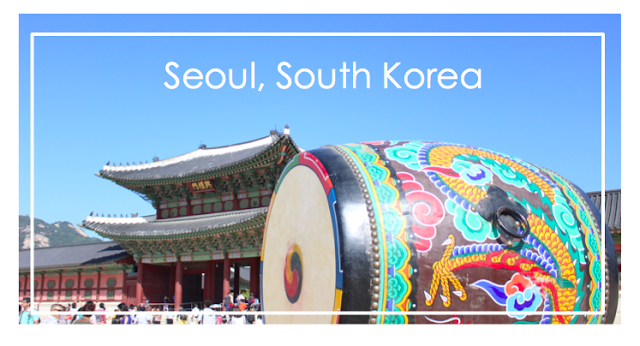 It’s one of the most romantic spots in Seoul, and also featured in a lot of movies and tv shows. This time I was there, they had a lot of creative things happening. There were LED displays of flowers on the wall, and also an LED show projected into the mist just above the river surface. Once you reach the very west end of the river, there’s a waterfall and a Christmas tree looking statue. To the north you can see Gyeongbok Palace in the distance. I’ve never seen Gyeongbok Palace at night, in contrast with during the day time when it’s raided with Mainland Chinese tour buses, it was extremely pretty and peaceful. So, no more Sunday morning Starbucks bagel ritual. Nothing opened until 10am. Seoul had the perfect kind of weather, a bit chilly but sunny. You feel slightly cold in the shade but then you feel warm when in the sun. It’s just really pleasant, along with the massive roads with grass and trees everywhere along the sidewalk. This weather and the nature just reminds me of my first orientation week in University when studying in Seattle. I hurried to Gyeongbok Palace for the 10am guard change. Last time I only saw the end of it when they were outside the gates, but this time I got to see the whole thing beginning to end. I just love how rich and how different Korean culture is from neighboring countries like China and Japan. The colors, instruments, and garment was very unique. The whole palace is also a massive area of land with many massive buildings with many rooms, even a Royal banquet hall in the middle of the lake. 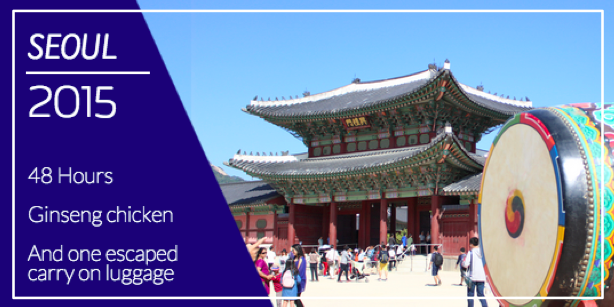 East of Gyeongbokgong, within a 10-15 minute walk is the Bukchon Hanok Village. It has rows of houses and small alleyways preserved since the Joseon Dynasty in the 1400’s and this area is often used for TV shoots. People nowadays actually still live in that neighborhood. There’s also a high point in that area where you can see Namsan tower in the distance. One street west of this neighborhood is also a street full of traditional Korean food, snacks, and dessert places. It has only started to be popular in the recent 5 years so it’s still not overly touristy which is good for a quiet stroll away from the crowded tour groups. I made my way to Hongik University area. Last year I was here it was busier than Myeongdong, crowded with students. It’s packed with restaurants, food stalls, boutique clothing stores, cafés, cosmetic stores, and bars. But again, I’m too early for Korea on a Sunday. There wasn’t much opened, and the street shops doesn’t open until 2pm. Somehow I managed to find a really good Korean BBQ restaurant. I was starving at that point, and the best thing about Korean BBQ is that they give you so many starter dishes for free before you even order any mains. So I was picking away on some kimchi, tofu soup, and I also ordered a big bottle of beer. After lunch, stores started to open. I picked up some more makeup, a few outfits, and donuts from Dunkin donuts to snack on later and also for next mornings’ 9am flight. Funny thing is, last year I bought 5 outfits in one particular store within 10 minutes of walking into it. It had exactly the style I wanted in the most reasonable price you could get for the quality. But I continued to walk around for a while and couldn’t find it. Blame my useless sense of direction, last time I stumbled upon it and didn’t bother to remember where it was. But, I did find some really good phone cases for my iPhone 5S which is basically an antique in Hong Kong. People are obsessed with getting the newest iPhone in HK that you can’t find phone cases for anything old once a new phone’s been out. Realizing that I’ve only bought items for myself and haven’t went souvenir shopping yet, so I went to Insadong (as much as I was trying to not go there). Insadong is probably the most touristy place in the whole of Seoul. It’s full of cheesy souvenirs like bookmarks, fans, key rings, and so on. I honestly don’t know what to bring back to share. If anything, I wish I could bring the food back. (And I did end up getting a few types of kimchi at the airport.) I walked around the Insadong and ended up not buying anything, oh well. I can’t remember the last time I had to wake up at such an absurd time as 5:45am. With half a donut in my hand and my suitcase, I auto-piloted towards the train station still half asleep. It’s Monday morning 6:30am, and I saw a group of 3 Korean guys helping their very much so wasted friend to get a cab home. The crosswalk light turned red so I stopped to finish my donut. Mr. Drunk dude started shouting “Konichiwa” at me, which was Japanese for “How’s your day”. Oh my god it’s way too early for this. I just nodded politely and hurried across the street. In fact it was way to early for anything. The escalator down to the airport train was probably something like 3 floors long. The railway was buried deep underground. One step onto the escalator, auto-pilot mode failed and my carry on slipped out of my hands, sliding at the speed of faster-than-I-can-run. It was really early in the morning, so the only person on the escalator was a good 2/3 way further than me on the escalator. He also had headphones in. So I ran behind my suitcase shouting “Be Careful!!!! I’m sorry!!!! !” and watched the suitcase hit the guy in the back of his knees. Thank god he didn’t tumble down the remaining 10 steps left. I look at him with the most embarrassed and apologetic face in the world and must’ve said sorry about 5 times. He didn’t seem to care, I did though. And that run down the escalators definitely woke me up. So a trick to not wasting time at the airport is to arrive with only 1hour to spare, which means you have 30 minutes to get through security, immigrations, and find your gate. Gimpo airport was more crowded than I imagine for an airport at 7:30. And the line for Korean Air was a good 5 rows long. So I strolled straight up to the Prestige/First Class counter. “Sorry I’m in a hurry to get to my flight” I was so late the display board didn’t even show my flight gate anymore. The counter staff did not even care, she just smiled and checked me in. I had enough time to go through security, immigrations, get kimchi for souvenir, get my tax back in cash, exchange all my Korean Won to Japanese Yen, buy myself a cup of hot chocolate, and sit down for a final update on my Instagram. Success. Next stop: Haneda International Airport. Tokyo, Japan. "Do you mean a coffee date?" * Guarantee you the girl will outdrink the guy. That is typical in Korea. People who works there are some of the sweetest people I've met. Save yourself some time and just go there. Everyone at Chicago event space is sweet and ask how you've been, even though normally staff keep their heads down.